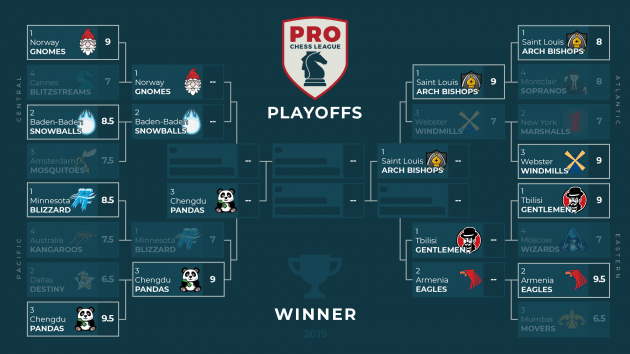 The PRO Chess League's playoffs are halfway through the quarterfinals. With two teams qualified and four teams left to compete for the two final spots, the question now is: Who will make it to San Francisco? Play continues Tuesday at 7:30 a.m. PDT (10:30 a.m. EDT, 2:30 p.m. GMT). The teams from the Eastern and Central divisions square off for 2 spots in this year's PRO Chess League Finals. The Armenia Eagles and Tbilisi Gentlemen have some of the top blitz players on Chess.com and also had the two highest regular season point totals in the league. Only one of these Eastern Division giants can make it to the Live Finals in San Francisco. In the Central Division we have two teams led by Arena King regulars. The Norway Gnomes won their division in convincing fashion and have GM Jon Ludvig Hammer on the top board, while the Baden-Baden Snowballs are led by GM Georg Meier, one of the top league performers since 2017. On Tuesday, we'll find out the last two of the four teams that will play in the live esports finale in San Francisco. For one of the most incredible chess experiences of your life, come to the Folsom Street Foundry on May 4-5 and watch some of the top chess players and teams in the world face off to become the 2019 PRO Chess League champions. Last week's preview: The first match is the battle of the Arch: The Saint Louis Arch Bishops vs the Webster Windmills. An incredible three out of eight of these players will be competing in this match during the rest day at the U.S. championship: Fabiano Caruana and Wesley So for the Arch Bishops, and Ray Robson for the Windmills. The Windmills also have strong young GMs Alex Shimanov and Illia Nyzhnyk on the roster. These two teams have a long rivalry in the PRO Chess League. In this exact scenario in 2017, St. Louis tied Webster 8-8 and advanced to the Final Four by virtue of having draw odds. This year, due to their first place finish in the regular season, the Arch Bishops have draw odds once again. In the Pacific Division, we have one of the most popular teams in the league fighting to make it to its first Final Four. The Minnesota Blizzard has Internet streaming sensations GM Andrew Tang and IM John Bartholomew on its roster, and playing in this match, the most important in Minnesota Blizzard history. To make it to San Francisco it will have to defeat one of the most fearsome teams in the league: the Chengdu Pandas. With three 2600 GMs in their lineup in Li Chao, Wang Yue and Zhao Jun, along with a super-talented young 1900 on board four, the Pandas hope to make it back to the PCL Finals this season, and this time win the whole thing. Watch all the PRO Chess League action on Twitch.tv/chess, Twitch.tv/prochessleague, and Chess.com/tv. Play starts Tuesday at 4 p.m. PDT (7 p.m. EDT, 11 p.m. GMT). The teams from the Eastern and Central divisions play next week on Tuesday, April 2.